The Venezuelan government is planning to produce a television miniseries on the life of late President Hugo Chavez in what it described as a "counter-attack" on a series on the same subject produced by Sony Pictures. 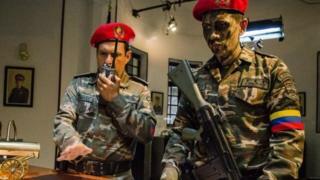 The first episode of the Sony Pictures series, entitled El Comandante, is due to air on Colombian TV later on Monday. Venezuelan President Nicolas Maduro said El Comandante gave a distorted view of his predecessor in office. President Chavez died in March 2013. Venezuelans are divided on how they view their former president and his legacy. To explain their unwavering backing, his supporters point to the significant reductions in inequality, poverty and malnutrition which Venezuela experienced under his leadership from 1999 until his death from cancer 14 years later. His detractors accuse him of being a populist who ruined Venezuela's once prosperous economy through mismanagement. According to Sony Pictures, El Comandante, while based on the life of Mr Chavez, is a work of fiction containing a high dose of "romance, espionage, betrayal and heroism". Mr Chavez is played in the 60-hour-long episodes by three actors, spanning his life from child, to adolescent and adult. The Colombian actor portraying him as an adult is Andres Parra, who played the infamous Colombian drug lord Pablo Escobar in the TV series El Patron del Mal (Boss of Evil). Parra said he had spent a long time trying to get to grips with the particular diction and rhetorical flourishes of Mr Chavez, whose lengthy speeches used to draw large enthusiastic crowds. But Mr Chavez's successor in office, President Maduro, has been scathing in his criticism of the series, accusing it of "twisting the truth". "We have to go on the counter-attack," Mr Maduro said. On Sunday, Venezuela's Culture Minister Adan Chavez announced that shooting would soon start on a Venezuelan-Cuban co-production about Hugo Chavez's life. The culture minister, who is the brother of the late president, said the working title would be "The True Chavez".